Neither bombs nor bumbling Americans broke the will of the Vietnamese. Something far more insidious and far-reaching, however, may have. Graham Greene's 1955 novel The Quiet American enjoys a certain prestige with American readers who identify themselves as progressive. This popularity comes from the perception that the novel discloses the ironic yet fatal consequences that evolve from American intervention in overseas conflicts. In this perception, the Americans come promising Freedom and Democracy but wind up bringing only Devastation and Death, yet remain unaware of the ironic outcomes of their actions since they cannot see past their own good motivations. As American novelist Robert Stone points out in his Introduction to the Penguin Classics Deluxe Edition, issued for Greene's centennial in 2004: "[Some] Americans embrace [the novel], professing to recognize in it a dead-on portrayal of the people they must endure as compatriots day after day." While this is true, in Greene's view these simpatico Americans are also dangerous buffoons, no better than the Beltway factotums whom they claim to despise. Perhaps it takes another Brit to understand Greene's perspective. Christopher Hitchens explains it in his review of the second volume of Norman Sherry's biography of Greene. 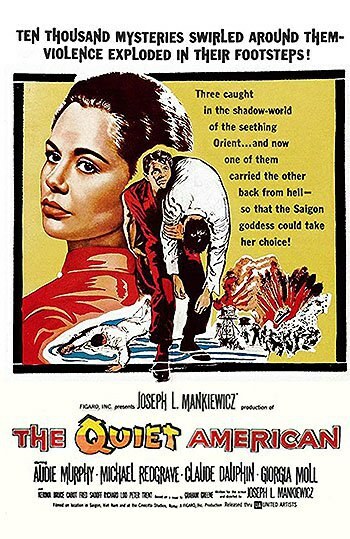 If you re-read The Quiet American today, you will see that it blames the blundering Americans largely for failing to understand or emulate the sophisticated French style of colonialism in Vietnam. For many of us the original sin -- if I may annex that term -- of the American intervention was precisely its inheritance of a doomed French war. For Greene, rather, it was the failure to live up to that legacy. Whatever it was, it was not a revolutionary or radical position. And it seems to have been content to overlook quite a few victims. Hitchens was ambivalent in his dislike of Greene. He admired the native talent, skill, and wit while abhorring the overt-Catholicism and pseudo-intellectualism. Nonetheless, Hitchens's interpretation dislodges the halo that fans have plastered above The Quiet American. As America once again ponders a land war in Asia, it's worthwhile to re-examine not only Greene's novel but also the film adaptions by Joseph L. Mankiewicz (1958) and Philip Noyce (2002) to see what insight, if any, they can impart. The plot of the novel is a classic love triangle, in this instance between an aging British journalist named Thomas Fowler, a young American operative named Alden Pyle, and a Vietnamese girl named Phuong. The story is that Phuong is Fowler's girl but Pyle falls in love with her and asks for her hand in marriage. Fowler would marry her, but his estranged wife is deeply religious and will not grant him a divorce (least ways not until the end of the novel). Phuong briefly leaves Fowler for Pyle but returns to him after Fowler takes an active role, unbeknownst to her, in Pyle's assassination. There are further side-characters, all of them "flat" in E.M. Forster's definition of the term, and since the genre is that of a political thriller, each one exists as a mouthpiece for various factions involved in the conflict. Related in the first person by Fowler in the form of extended flashbacks punctuated by visits from a French detective questioning Fowler about Pyle's murder, the novel is also uttered as a form of confession and thus is an attempt to analyze guilt in a time of wider conflict. The novel has a reputation for being as prophetic which comes partly from the timing of its release. The humiliating French defeat at the battle of Dien Bien Phu in 1954, which signaled the beginning of the end of French Indochina, occurred only a year before the novel was published. In Green's conception, the French were aware that they were fighting not only for their colonial prestige but for the European psyche. A French bomber pilot tells Fowler, "I'm not fighting a colonial war. Do you think I'd do these things [drop napalm] for the planters of Terre Rouge? […] We are fighting all of your wars, but you leave us the guilt." The Americans, in Greene's view, had no such guilt. They believed that they were fighting a good fight, one that stopped the spread of Communism by spreading Freedom and Democracy where European colonialism was failing. In Pyle's conception, this effort required a "Third Force" of fighters that was neither European nor Communist but comprised of the armies of sympathetic local warlords. Fowler responds to this notion with a speech to Pyle in which he says, "[Warlords] aren't going to save the East from Communism. We know their kind." The "we"m he explains, are "the old colonialists", that is, "we" Europeans, who overcame feudalism by creating the Enlightenment. The Americans, by contrast, come from a youthful culture and are thus "innocent" in a way that the older European and Asian cultures are not. This innocence leads directly to Pyle not only stealing Fowler's girl because he wants to "save her", he says, but also to aiding and abetting a terrorist bomb attack in a crowded Saigon market in which civilians are killed. Pyle explains to Fowler that they were "only war casualties", and "it was a pity, but you can't always hit your target. Anyway, they died in the right cause" (the phrase "collateral damage" had not yet been invented). Fowler helps to murder Pyle because, in his explanation, in his bumbling innocence he had becomes a mass murderer who would go on killing without understanding that he was merely helping a vicious warlord and not Democracy with a capital D. Fowler says, "I never knew a man who had better motives for all the trouble he caused." In the end, with Pyle dead, Fowler gets Phuong back, too. But what is Phuong to Fowler? He very purposefully connects her to the most overused fetish of Eastern exoticism: opium. In describing her, he quotes from Baudelaire's poem L'invitation au voyage, then explains "I thought that if I smelt her skin it would have the faintest fragrance of opium, and her color was that of the small flame. I had seen the flowers on her dress beside the canals in the north, she was indigenous like a herb, and I never wanted to go home." She is, "the hiss of steam, the clink of a cup, she was a certain hour of the night and the promise of rest." 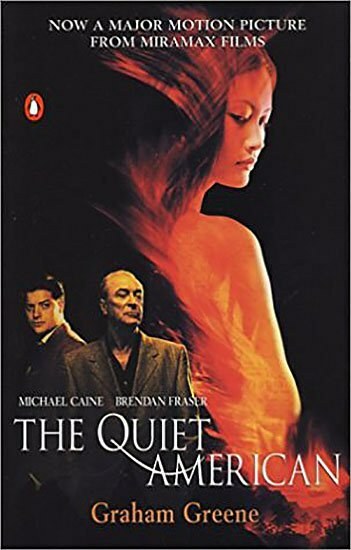 The connection with Baudelaire is extended by the fact that Phuong does not speak English, only French. 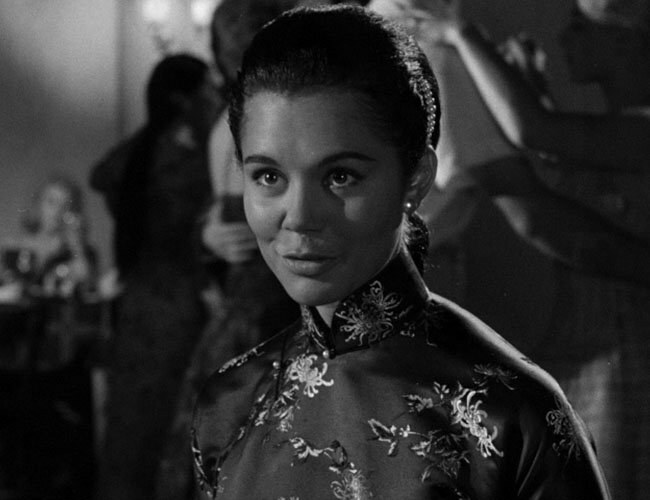 Her first connection is to Asia, her second to Europe (in a superb moment of dark comedy of the type at which mid-century British novels excel, Fowler must translate for Pyle when he comes to woo Phuong since Pyle doesn't speak French). For Pyle, Phuong is a damsel in distress. For Fowler, she is a potent combination of feminine comfort and exotic fetish. Greene presents her as emblematic of Vietnam, but in the course of this construction, she is given no voice. If Phuong thinks anything about being in the middle of a tug-of-war between white men and their ideologies, Greene does not provide her thoughts. At the center of his novel about Vietnam is not a well-rounded Vietnamese character but an exotic object that dissolves and reforms without substance, like so much opium smoke. This is not to take from Greene his power as a writer. When it comes to tightness of plot and descriptive language, his reputation as a master author is richly deserved. His reputation as a soothsayer is less so. Greene believed the Americans were fighting for hollow causes, and he also believed that the French couldn't win the war, but his narrative drops off at that point. He offers no solutions or even ameliorations (except for opium and French poetry) and this absence creates a callowness at the heart of the novel. He diagnoses symptoms, not causes. Despite this deficiency, his depiction of American innocence and the trouble it causes for everyone else still finds its target and resonates not only with the American intervention in Vietnam but in later conflicts including those we are embroiled in today. What happens when this anti-American complexity falls into the hands of American film studios? The 1958 production is best known for changing Greene's ending. At the height of the Cold War, director and producer Joseph L. Mankiewicz was coerced into twisting a blatantly anti-American novel into a piece of pro-American propaganda. Unfortunately, this makes the film feel today like a period piece, a museum exhibit of the mid-century American psyche. Despite this profound shortcoming, the film still packs in delights. It was partially shot on location (apparently the first American feature filmed in Vietnam), and one of the most satisfying elements is watching the background scenery of late '50s Saigon, which appears remarkably tidy and clean compared to the modern megacity. The scenes at the Cao Dai temple are also worth watching closely for their documentary value. Mankiewicz was a serious and experienced filmmaker and his artisanship is on point here. His style blends noirish elements such as chiaroscuro and tilted camera angles with a classic understanding of the space within a scene. There is a fine sense of how the camera and lighting and staging can create an illusion of depth without calling attention to itself so that the audience becomes immersed in the depicted world without resorting to special effects. By comparison, the 2002 version has all the flatness, speed, and compression of a TV show. It isn't the size of the screen but the production values (and let it be said, the budget) that are followed. The casting of the male leads is superlative. Accomplished thespian Michael Redgrave brings Fowler completely to life. He moves like a middle-aged mid-century British person (which, of course, he was), stiff and uncomfortable in his own skin, which makes both his seduction of the younger Phuong and his eventual participation in Pyle's murder all the more complex. This is contrasted with Michael Caine's later incarnation of Fowler, which still carries too much of the hip-guy swagger with which Caine made his early career in British films such as Alfie (1966) and Get Carter (1971). American actor Audie Murphy is not given much screen time but he makes an excellent Pyle. Gangly yet sweet faced and full of farm-boy conviction, his embodiment of Pyle perfectly captures Greene's depiction. However, Murphy was a real life war hero and was well known to his American audience. Having a British journalist murder him without making a martyr in the process would have caused an uproar. The casting determined the narrative's outcome: for the American audience of the period, Murphy was the hero before the first reel ended. The screenwriters even changed the objectionably satiric name "Pyle" to simply "The American". Unfortunately, Hollywood whitewashing was in full-force with the casting of Phuong, who is played by an Italian actress named Giorgia Moll. Moll is pretty but rather wan and when she's standing next to Asian extras, her European features are particularly noticeable -- and for modern audiences, distracting. Her attempt at an Asian accent is excruciating, of the "me rikey you a-rot" variety. In a larger sense, by replacing the exotic object of desire with a more familiar face, the key element of Greene's narrative is distorted. Not only is the political metaphor lost, but in the course of the film, it's hard to see what Fowler and Pyle are fighting over: an Italian tart in Chinese costume? That's the stuff of B-movies. I have to admit that I was curious as to how the screenwriters would go about changing Greene's ending without completing re-writing the story. "Clumsily" is the best descriptor. The film more or less follows the original story then crudely tacks on a 30-minute final act in which Fowler learns that Pyle was innocent. Turns out Fowler's been bamboozled by the wily Communists who capitalized on his anger that Phuong left him for a younger man. In the end, he loses Phuong and is made a public fool. Even after Fowler gets his comeuppance, the filmmakers felt the need to press their point. A closing title card reads "To the people of the Republic of Vietnam -- to their chosen President [Ngo Dinh Diem] and administration -- our appreciation for their help and kindness." At the time, Ngo Dinh Diem was allied with the American military. It has been suggested the Mankiewicz needed to add this sycophantic message in order to get permission to film in Vietnam, but knowing the subsequent history of American involvement in Indochina, it leaves one very cold indeed. Ngo Dinh Diem was assassinated a mere five years later, in a 1963 coup carried out with well-documented American connivance. He received his death on his knees in the back of an armored personnel carrier. The weapons were a bayonet and a revolver. 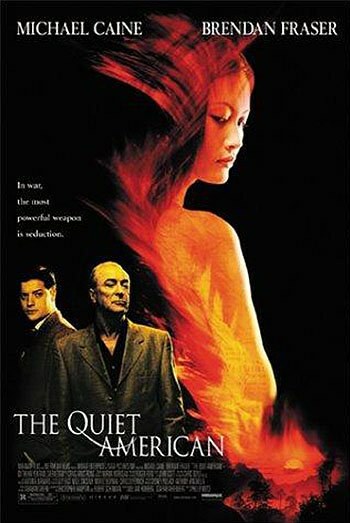 The 2002 adaption restores Greene's original ending and improves on the whitewashing of the earlier production by casting an actual Vietnamese woman (the lovely if forgettable Do Thi Hai Yen) in the role of Phuong. However, from point of view of craft, it is a weaker film. It has the virtue of being shot entirely on location and in color, but was filmed so long after the period of the story that it looks like a costume drama, which in fact it is. The framing and staging and lighting lack style and, as noted above, the film looks likes it was shot for television (which raises the question, where is the British-produced mini-series adaptation of this novel?). Michael Caine is passable in the role of Fowler, though he is merely playing the British Everyman that he's played in countless Hollywood productions prior to, and after, this one. What's it all about, Alfie? The bigger problem -- quite literally -- is Brendan Fraser as Pyle. At the time, Fraser was known for indie productions such as 1998's Gods and Monsters in which he plays the love interest of Ian McKellen. However, he's probably best remembered now as the swashbuckling lead in the CGI-laden horror-action films casually called The Mummy Trilogy (1999, 2001, 2008). Both of those roles -- gay hunk, mummy killer -- require physical bulk. The problem in The Quiet American is that he towers over the rest of the cast. He steals scenes simply by filling them. While his acting is solid, his physical size is disproportionate to the story as well as anachronistic. Guys in the '50s simply were not that big. I can't say what made me fall in love with Vietnam. That a woman's voice can drug you? That everything is so intense: the colours, the taste, even the rain? Nothing like the filthy rain in London. They say whatever you're looking for you will find here. They say you come to Vietnam and you understand a lot in a few minutes. But the rest has got to be lived. The smell, that's the first thing that hits you, promising everything in exchange for your soul. And the heat. Your shirt is straight away a rag. You can hardly remember your name, or what you came to escape from. Such romantic fiddle-faddle recalls the worst of 19th century travel writing that set the benchmark for cliché fantasies of the exotic tropics. There's nothing here about Vietnam; swap the word "Colombia" or "Zimbabwe", and the effect is exactly that same. The swelling soundtrack and Caine's measured intonation can in no way bring meaning to this vapidity. This swooning exoticism is part of Hollywood producers' assumption that the audience is stupid. Perhaps that's not totally unfair. These people have to deal daily with the likes of Michael Bay and that undoubtedly clouds one's perception of humanity's potential, but it also means that they feel the need to explain the story for the audience in a way that undermines the supposed innocence of Pyle. At one point, our beefy quiet American rather starkly proclaims: "Let's just look at Phuong. There's beauty. There's the daughter of a professor. Taxi dancer. Mistress of an older European man. That pretty well describes the whole country." This is how an adjunct lecturer would explain the book in a freshman lit course. Greene himself never felt the need to point out his symbolism to his audience. He trusted them to understand the story without such on-the-nose dialogue. He also never tells us about Phuong's parents. That's a manufactured element of the screenplay that alters the nature of the character. In a single throwaway line, they make Phuong a fallen woman, which in turn paints a different complexion of her relationship with Fowler. The filmmakers unintentionally cast Pyle in the better light. The dumbing down of the narrative achieves its lowest point in the denouement moment. Hollywood needs a villain in a very large black hat, and the version of Pyle that Greene created was too nuanced for Miramax. In the book, when the terrorist bombs burst in the Saigon market, Pyle is stupefied by the carnage he caused. Greene wrote: "Pyle had been silent a long while, and I had nothing more to say. […] He looked white and beaten and ready to faint." At this critical juncture in Noyce's film, we learn that Pyle actually speaks fluent Vietnamese and is the mastermind of the whole attack! Sacré bleu! This changes the entire view of the character. Instead of being an innocent who causes carnage out of bumbling, he is a shrewd operator who has successfully duped everyone. He's now a ruthless super spy! Ya-tah-ta-dah! Nonetheless, Fowler dispatches him and just as in the novel, he recaptures Phuong while keeping his role in Pyle's murder a secret. Fine. But the filmmakers decided to tack on a montage that depicts the subsequent history of Vietnam that neither Greene nor Mankiewicz could have included in the late '50s. What comes across in the montage is the American war, the American pain. The Vietnamese call this conflict the "American War" while the Americans call it the "Vietnam War" and what we see in this American-produced montage is the American experience in Vietnam. Americans lost that war and the montage does not try to change history but it unintentionally reinforces Greene's message: the American war in Vietnam was about America, not about Vietnam. What is lost in the fatuousness of the montage is that America chose this war. A tragedy, in the modern sense, needs to be accidental; what the Americans deliberately brought -- as Greene anticipated -- was a murderous farce. The solemn montage at the end of Noyce's film tries to turn farce into tragedy by capitalizing on the very real pain American soldiers experienced in a war they were told to fight. In its attempt to stay true to Greene's narrative, Noyce's film instead presents Hollywood righteousness at its most… innocent. Yet, in the final tally, the Americans won the war. For many years after the Vietnamese economy began to open up in the late '80s, the only American consumer corporation that was visible on the streets was Kentucky Fried Chicken. The joke was that this was because KFC's mascot, Colonel Sanders, bore an uncanny resemblance to Ho Chi Minh (the memes abound; Google it). A visit to Vietnam today will prove that things are far different. Name an international American consumer brand and it is more likely than not to be found on the streets of Saigon or Hanoi. While rural Vietnam retains some semblance of the country that so many people fought over, it's also cracking under the weight of global consumer culture. The self-imitation begins when the tourists start arriving by the busload. This slow colonization makes The Quiet American quaint reading today. Vietnam remains Communist. It was not bombs that broke the will of the Vietnamese. It was something far more insidious. It was Colonel Sanders. We now know what Greene only hints at: the quietest Americans do not speak for the State Department or the Pentagon. They speak for KFC and Starbucks. The corporatization was not inevitable but it is nearly irreversible. And now that they've taken the opium away, all we're left with is old French poetry. This is the first of two articles on pop culture depictions of the American War in Vietnam by William Gibson.